Today is day one of my summer vacation. Yahoo! I’ve already been out for a kayak paddle and I’m thinking about which old movies I want to watch in the late evenings with a scoop of my favourite ice-cream, (Pralines and Cream incase you are wondering). Thumbing through one of my movie listing books, I find myself drawn to Charlie Chaplin’s classics. As a child I remember watching many of his films with my father (re-runs of course – I’m not that old!) and being enchanted by the man in the bowler hat, his sad smile and his magical light-footed dances with his cane. Charlie Chaplin’s personal life rivalled any tale he told on the silver screen. He married four times with brides being younger than himself. He was kicked out of the United States and knighted. His coffin was stolen and then held for ransom. But what makes him truly great is his comic genius. This film director, actor, composer could zero in on human frailty. By examining weakness through the lens of a camera he opened up the eyes of the soul. Charlie Chaplin was born on April 16, 1889 in the slums of London. His parents, Charles and Hannah Chaplin were music hall entertainers. His father, who had more than a little fondness for the bottle, deserted his family when Charlie was 1-year-old. Hannah was a sickly woman at the best of times. It was because of her illness that young Charlie made his first stage appearance. He was 5 when he sang a song subbing for his mom who was too sick to perform. Hannah suffered from mental illness. Charlie led her through London’s streets dodging stones thrown by neighbourhood thugs as he sought care for her at the asylum. I can imagine his sadness being the inspiration for his classic tune ‘Smile’ Chaplin wrote for his film ‘Modern Times’, sung here by Judy Garland. With his mom in the asylum, Charlie and his older brother Sydney lived in a workhouse – just like those in Charles Dickens’ novels. Even when his mom was finally released things didn’t get any better. They still lived in poverty. Charlie and Sydney shared one pair of shoes. One time his stockings were cut from a pair of his mother’s cast-offs. They were bright red and the kids yelled taunts christening him ‘Sir Francis Drake’. Fred Karno took his troop to the U.S. in 1910 where they toured for 2 years. Charlie was 21. His room-mate was Stanley Jefferson AKA Stan Laurel. Charlie was curious and life with all its mysteries, interested him. He was self-taught on many subjects including music and playing the cello and violin. There is a story circulating that the main reason he learned to play these instruments was because cooking was not allowed in his boarding house. He would practise to cover up the sounds of Laurel frying his supper on a hot plate. ‘The Limousine‘ from the film ‘City Lights’ composed by Charlie Chaplin. Charlie tired of touring and when Mack Sennett of Keystone film company caught the show he offered Charlie a contract to make two-reelers in Hollywood. He jumped at the chance. In 1914 Charlie made his first two films- ‘Making a Living’ & ‘Kids Auto Races at Venice’. These movies not only made Charlie a living but began his trajectory into super stardom. He cased the Keystone wardrobe department and took a bowler hat, cane, baggy trousers and tiny moustache. His metamorphosis into the Tramp began. In 1 year he made 35 two-reelers for Sennett. Chaplin said, ‘All I need to make a comedy is a park, a policeman and a pretty girl’. By the end of 1914 his name was known throughout the world. Composer Darius Mihaud was inspired to compose for Chaplin. Charlie didn’t even ask him. He didn’t have too. People stood in line for hours to catch a glimpse of their idol. Headlines in papers shouted in bold type, ‘HE’S HERE!’. Charlie Chaplin was 27. Charlie moved on to the ‘Mutual Company’, another film studio where Charlie became a cash cow. His success was stirring up resentment in his hometown across the pond. Charlie Chaplin’s biographer and friend wrote, “Londoners thought he was a shirker for not fighting with the British Army in the First World War. Charlie countered with the facts: He had raised huge sums in war bonds through personal appearances. He was registered for the draft in America, but he had never been summoned”. When he visited London a few years later, all was forgotten. He was given a hero’s welcome. In 1918 Charlie moved his own studio to Sunset Boulevard and married for the first time. He was 28, and his bride was a 16 year old actress named Mildred Harris. The marriage like Hollywood marriages today, lasted no time at all. The cards were stacked against them. Charlie worked all the time. Mildred’s mother moved in and tragically their young baby Norman Spencer Chaplin died 3 days old. During the filming of ‘The Gold Rush’, 35-year-old Charlie fell in love with the 16-year-old actress groupie, Lita Grey. They wed in 1924. Things looked like they might work out At least for a short time anyway. Charlie was working, making money and becoming even more famous. 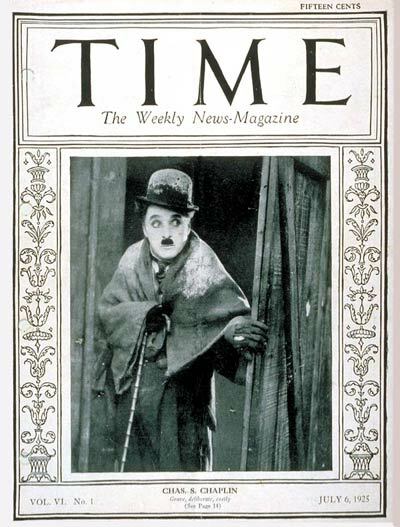 He even garnered the distinction of being the first actor to appear on the cover of ‘Time” magazine. (July 6, 1915). Alas the marriage was not to last. Lita left with her 2 sons and sued for divorce. Jerry Epstein wrote: ‘In court Lita wept buckets and claimed she had no money for her children’s milk.’ More headlines! The strain was too much. Charlie had a nervous breakdown and she had a million dollar divorce settlement. Charlie Chaplin’s piece, ‘The Terry Theme’ from the film ‘Limelight’. Charlie Chaplin married 19-year-old chorus girl Paulette Goddard in 1933. A few years later they stared in his silent film ‘Modern Times’. It was brilliant. He captured a modern society, very different from his youth, fast paced, industrialized and in Chaplin’s view, ‘dehumanized‘. Charlie and Paulette starred in another great Chaplin film, ‘The Great Dictator’. Talk about life copying art – years earlier, Adolf Hitler was a big fan of Chaplin, so big in fact that he grew his mustache like that of the little tramp. Before that, Hitler’s mustache was a 1880’s type of handlebar. Just as war was breaking out, Chaplin based his anti-nazi movie, ‘The Great Dictator’ on Hitler – a Jewish barber whose resemblance to the fascist dictator gets him into trouble. The last time the Little Tramp appears it is as a Jewish barber shaving a customer to the music of Brahms. Click on the YouTube link on the bottom left hand corner of the screen. It will take you directly to YouTube. This is probably the first music video well before Much Music!! This is well worth the click! Trust me one of the greatest speeches on film and a chance for you to hear Chaplin’s voice. Chaplin made no films for 7 years. He divorced Paulette and married his final wife 18 year old Oona, daughter of playwright Eugene ONeill when he was 54. This was the beginning of the end of Chaplin’s life in the U.S. Things were not going well. Some people were outraged at the age difference between him and Oona. His film Monsieur Verdoux released in 1947 ran amuck of the American political climate of the day. Its pacifist leanings didn’t sit well with the beginnings of the Cold War. Chaplin was accused of being a communist. His films Verdoux and Modern Times were cited as being anti-capitalist. He denied those charges while testifying before the committee, ‘I am not a communist, neither have I ever joined any political party or organization in my life’. But public outcry for his deportation continued.